Greetings from DCT Vacations Pvt Ltd | Dreams Come True! We value our travelers with customized Packages. DCT Vacations Pvt Ltd is an organization established in 2014. Our presence is in two different locations first is Lugano in Switzerland and second is India. You may also find our presence in International Travel Fairs. This organization is one of renowned travel agencies which engaged in offering dependable solutions for diverse travel requirements. We are legally authorized Travel Agent with approved GSTIN as “09ABMPU1961B1ZH”. Our solutions are available for corporate as well as leisure travelers. 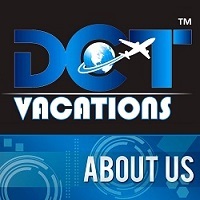 As domestic and international tour operator, we thrive to offer only exceptional travel services through www.dctvacations.in, www.dctvacations.com and www.usa.dctvacations.com to all our clients since 2014. Besides this, we bring our services forth existing 29 states and 07 union territories in India as http://www.dctvacations.in/flipbook.php. Our comprehensive services are inclusive of Domestic and International tours for leisure & business, deals in whole Asia as domestic, inbound & outbound tours including hotel reservations, foreign exchange assistance, visa services, domestic & international air ticketing and overseas travel-insurances. We are providing the services to the visitors of family holidays, honeymoons, group, meeting and incentives as well as special interest packages for senior citizens and women specials with advance purchased seats in Flights and Hotels. We are also keen into the special services like Escorts Service for Groups of Leisure and Corporate as well. Besides this, we bring forth exciting Indian travel packages for Rajasthan, Kerala, Golden-Triangle, Himalayan Tours, Himachal & Uttaranchal, Andaman-Nicobar and Lakshadeep. We also organize International Tours for Nepal, Srilanka, Maldives, Malaysia, Singapore, Thailand, Mauritius, Indonesia-Bali, UAE-Dubai and Europe. We are blessed with a team of skilled professionals with an experience of 5-10 years, who conduct tours with utmost perfection and assist the clients in selecting better destinations for travel. In order to provide excellence to the client, we ensure that only expert travel agents conduct the tours. So, feel free to contact us anytime. Our India office is based in Delhi / NCR, Uttar Pradesh (India).